My dad gave us a barely or not-at-all used fryer some months back. I wouldn’t have gone out and bought one, but I was happy to accept the gift. For the most part I avoid deep fry cooking, but every once in a while I choose to indulge. 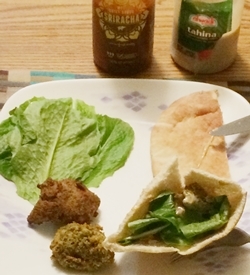 One of my favorite dishes to cook that way is falafel. The vegetarian nature of the dish makes up, in part, I like to tell myself, for the deep frying. With canola oil and the falafel mix at least there is no cholesterol. I selected the Sadaf brand of falafel mix because it is the lowest in sodium of the four or five brands carried by our local Middle Eastern market. The pita bread was in the freezer from a previous batch of falafels. The tahini and Sriracha were in the fridge. It was an indulgence. And it was a very tasty dinner. I just bought an air fryer! I can’t wait to try it out. I’m sure fries are going to be way better than oven cooked. I thought about getting an air fryer, but went with a NuWave instead. Let me know how you like yours.